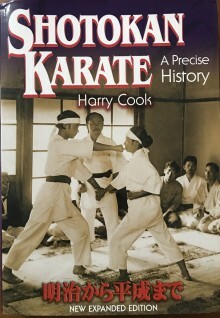 Libro Shotokan Karate - A precise History, Harry COOK, inglés. 2º edición ampliada. Cubierta dura. 512 páginas, más de 200 fotos. A new expanded edition of this landmark book. It is packed with 180 pages more information than the first edition, 100+ more photos) larger appendices, and a more comprehensive index. A large format, hardbound, collectors edition of 512 pages, printed on the finest European papers by a press established in 1756, it will NOT be available through bookstores.